Monitoring GPO changes is quite complex discipline and for covering all aspects is available couple of tools or extra modules. 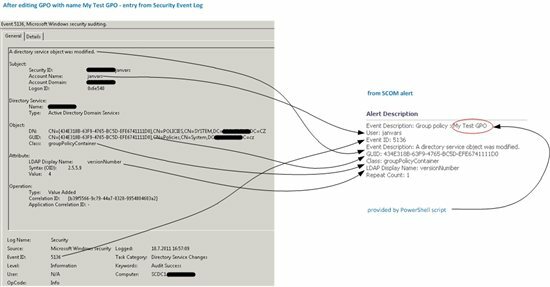 Goal of this article is not detailed analysis of monitoring GPO changes but guidelines how to use recourses of SCOM and PowerShell to get basic overview of GPO monitoring. By monitoring we can rely on auditing more precisely on events that are created in security log. Using this method is quite straightforward but has one important weakness. 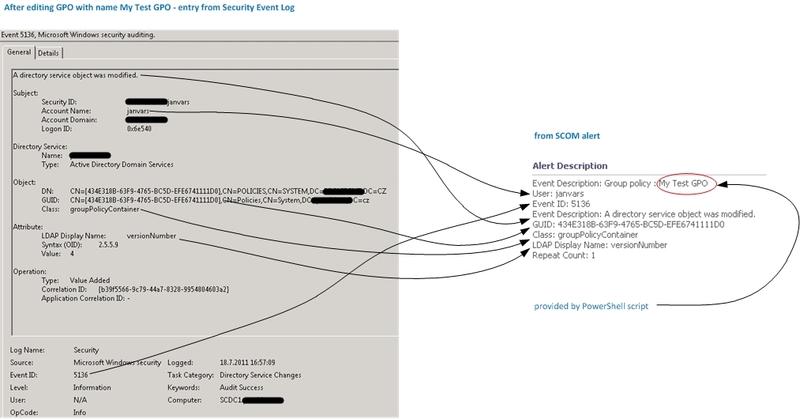 Events in security logs are notifications saying that in GPO were made any changes but are not saying what exactly was changed. As I mentioned above detailed monitoring of GPO changes is quite complex, I’m not covering this. What I’m going to describe is how to set SCOM to notify that something in GPO was changed and how to customize these notifications. All mentioned steps are descripted bellow. Setting up security audit can be performed either on individual server or large-scale using Group Policy. Alert created by this rule is just temporary and is used only for collecting parameters. If we look closer at all provided parameters we will find that there is missing probably most imported parameter which is GPO name (event 5136 provide only GPO GUID). This is the main reason why to create a PowerShell script and let it run our code behind. In following paragraphs are introduced particular pieces of code. There are provided just the most imported parts of code i.e. there is not error handling or logging. It is just example from my lab and before introducing into production it must be tested and customized based on specific environment. $script:SCOMCliApi = new-object -ComObject "MOM.ScriptAPI"
$scomAlert = Get-Alert -Id "$AlertId"
$gpoClass = Get-ValueFromDescription $scomAlert "Class"
$gpoEventDescription = Get-ValueFromDescription $scomAlert "Event Description"
$gpoEventID = Get-ValueFromDescription $scomAlert "Event ID:"
$gpoLDAPDisplayName = Get-ValueFromDescription $scomAlert "LDAP Display Name"
$gpoAcctName = Get-ValueFromDescription $scomAlert "Account Name"
$gpoGUID = Get-ValueFromDescription $scomAlert "GUID"
$gpoGUID="[ERROR] GUID not found (provided NULL GUID)." $Text="$($Global:gpoNameStr)`n User: $($gpoAcctName)`n Event ID: $($gpoEventID) `n Event Description: $($gpoEventDescription)"
$Text = $Text + "`n GUID: $($gpoGUID) `n Class: $($gpoClass)`n LDAP Display Name: $($gpoLDAPDisplayName)`n Repeat Count: $($scomAlert.RepeatCount)"
$gpoGUID = Get-ValueFromDescription $scomAlert "Value"
$gpoGUID="GUID not found (no value provided)." $gpoOUDN = Get-ValueFromDescription $scomAlert "GUID"
$Text="$($Global:gpoNameStr)`n User: $($gpoAcctName)`n Event ID: $($gpoEventID)`n Event Description: $($gpoEventDescription)`n OU: $($gpoOUDN)"
$Text = $Text + "`n GUID: $($gpoGUID)`n Class: $($gpoClass) `n LDAP Display Name: $($gpoLDAPDisplayName)`n Repeat Count: $($scomAlert.RepeatCount)"
$parsedText=$parsedText.Split("`n") | Select-String -Pattern "$Field"
Creating new entry into SCOM event log give us flexibility by creating final alert. We can go first through some test rounds and tune all parameters and script. Then it is just piece of cake – create new collecting rule that will collect only events from SCOM event log, in our case only with event id 11101. And finally create long-awaited rule for firing up new alert with necessary information. By testing you will see that only little change in GPO (like rename) will rice always at least two new entries in security log (by editing settings in GPO you will find probably tens of them). This is the reason, why to use alert suppression. Think about where you save PowerShell script. By default script is used in security context of default Action Account (AA), so you need to ensure, that AA has at least read permission and in case you create some output log into text file AA needs write permission as well. Also consider that same AA is used for translating GPO GUID to GPO name. It means that AA needs at least read permission on each Group Policy Object. By default on each GPO is set delegation for group Authenticated Users with read permissions, if you use AA as standard domain account it should be fine. Do not forget consider this aspect in multi domain or in multi forest environment. Do not forget to grant to AA account in SCOM at least user role “Operations Manager Operators”. The reason is that by default AA does not have permission to close alerts.